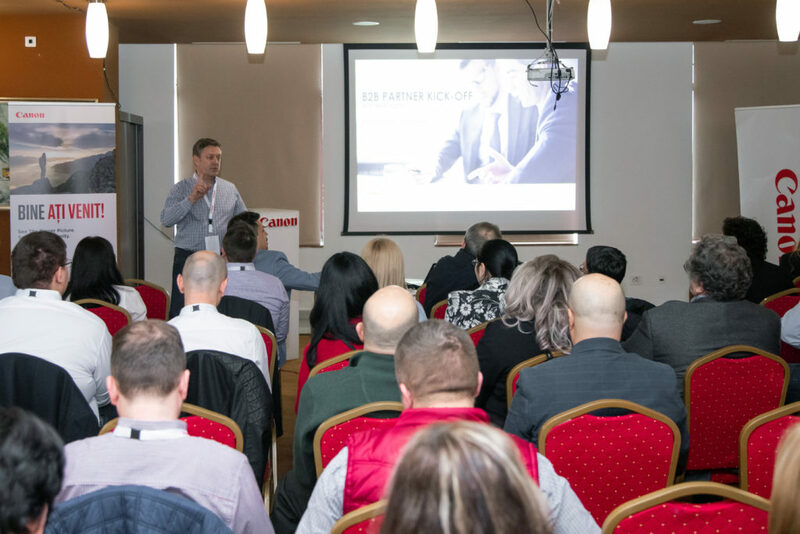 At Canon’s partner event, held between 20 and 21 March 2019, at the Valea cu Pesti Hotel, Transfagarasan, Romania, Eurocom was named the 2018 Canon partner for the production printing segment. We are honored to have been the most active Canon partner for 2018 on the production printing segment. It is an extra recognition of my colleagues’ efforts and an incentive to maintain our position this year too. Gabriel Kaufmes, Executive Director, Eurocom S.A.
At the Canon partner event, the latest news on equipment and software applications dedicated to printing, complete and complex solutions specifically designed for specific business segments such education , manufacturing, etc. were presented. Nearly 50 representatives of Canon partner companies gathered to learn, explore and share digital printing best practices at European level. It was an excellent opportunity to change business ideas, but also to socialize. Eurocom became a Canon partner in 2010 as a result of the merger between Canon and Océ. At present, Eurocom is a Platinum Partner, selling a wide range of Canon print business solutions.